This week has flown by and we are now nearing the end of the month of January. 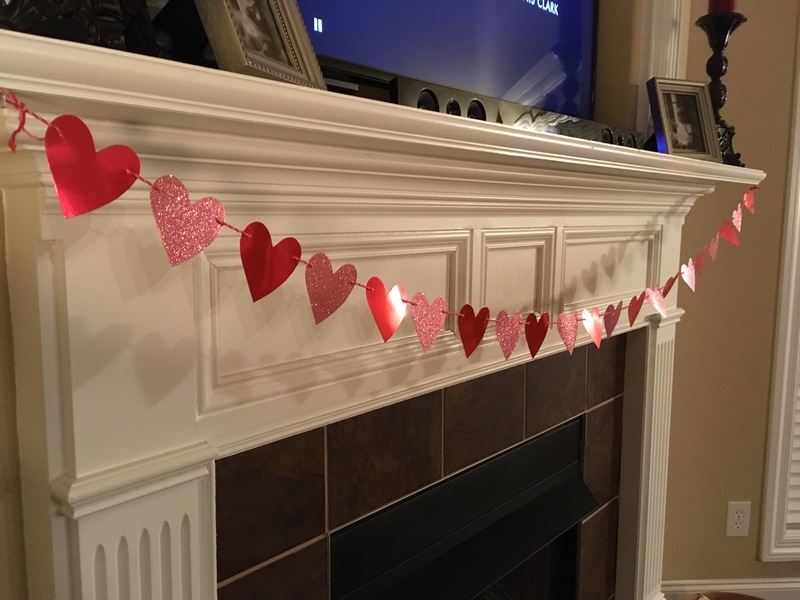 I was able to change over the snowmen decorations to Valentine’s decor Friday night. I always love adding little holiday touches to our house. I have enjoyed a pretty relaxing weekend and was able to finish my fourth book of the year. I started another read tonight and will enjoy reading it when the time allows. I have my meal planning to do for the month of February. I know how much of my time will go into planning my meals and making my grocery list, so I have been putting it off. I guess that I’ll work on that here shortly. We are getting ready for a new and busy month. Joshua has been practicing for his school 6th grade baseball team and his travel ball team. He starts his school games this coming weekend. He will be playing 10 games throughout the weekends in February. He is very excited and I am looking forward to seeing him back out on the field. Jackson is doing really well with his piano lessons. 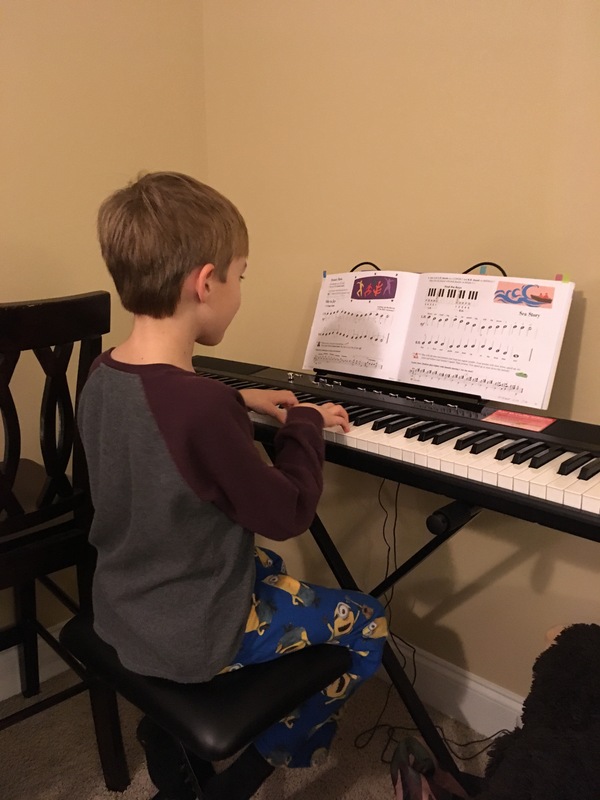 He loves his keyboard that we bought him and loves to practice from his lesson book and make up his own songs. He always enjoys his lessons and is always pleased showing us what he can do. Abby Kate is still doing well with her recovery. The recovery has been a bit harder than the initial surgery recovery, but she is working so hard each day to get stronger. I am proud of her and the way she continues to persevere. Thankfully, I’ve found it easier to get up in the mornings. After the Christmas break, I quickly found that I needed to put my phone away from my bed each night. I always have a hard time getting up and that one little step has helped me wake up more fully in the mornings to turn off my alarm (and to not wake my sleeping husband). I also love having my phone away from my bedside when going to sleep. It really is amazing how quickly time can get away from you when you have your phone to scroll through. I’ve made it a goal to get away from my phone more and this extra little step has really helped. I did find myself asleep around 9:30 a couple of nights this week though. The weather this month has been a bit crazy. I am loving that the night is coming a little later each day. 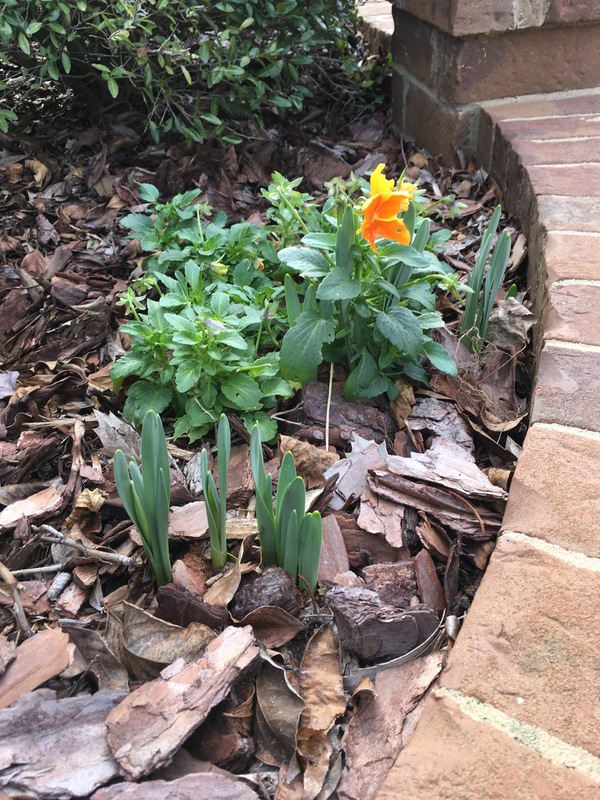 I was so surprised to see that some of my daffodils are starting to poke through the soil. For me, I feel like my life can be a little rushed. There is always a to-do list a mile long. There are always meals to be made, errands to run, groceries to buy, and more. My life very rarely slows down, but I must take the time to allow the important parts of me to bloom when the time is right. I need time to not rush through my daily schedule, but to allow God to speak in those moments when I need to be still.